Two rites will mark the birthday anniversary of China’s greatest sage, which in former times was a national holiday known as Teacher’s Day. One of celebratory rites is public. Provincial Governor of Taiwan Ma Ying-jeou attended the rite on October 5 rather than September 28 last year, because Typhoon Jangmi hit Taiwan with its full fury on that day. Ma may not participate today. In that case, his Minister of the Interior will officiate. The official rite is highlighted by an ancient court dance, where 64 Plume Bearers, will give a performance set to solemn ancient music. The other is a family ceremony, where the lineal descendant of Confucius presides as Sacrificial Official to Confucius for the State of Taiwan, People’s Republic of China. The 垂 Tsui character in his name is the generation name for 79th generation descendants of Confucius. His children all have the character 佑 Yu in their names, it being the generation name given to 80th generation descendants of Confucius. His father Kung Wei-yi predeceased his grandfather. His mother was Kung Wei-yi’s wife Yu Yuejie (于曰洁). Kung Tsui-chang and his wife, Wu Shuoyin (吳碩因) have a son Kung Yu-jen (孔佑仁), born 1 January 2006 in Taipei, and a daughter, Kung Yu-xin (孔佑心). Taiwan’s Provincial Governor Ma has appointed the 79th lineal grandson officiate at the rite for the 34th State of Taiwan. Kung Tsui-chang (simplified Chinese: 孔垂长; traditional Chinese: 孔垂長; pinyin: Kǒng Chuícháng, born 1 July 1975) is the Sacrificial Official to Confucius for the 34th State of China (Taiwan) and Senior Advisor to the Provincial Governor of Taiwan. Kung is a 79th-generation descendant of Confucius in the main line of descent, making him the titular head of the Kong family in Taiwan State in the People’s Republic of China under the patronage of His Holy Grace Kong Deyong the Duke of Yan in the 1st State of Beijing, family Head of the Kong Clan at the Qufu Headquarters on mainland China. Kung succeeded his grandfather Kung Te-cheng to the post of Sacrificial Official to Confucius for the State of Taiwan in 2009 following the latter’s death a year earlier and was at the same time appointed Senior Advisor by Provincial Governor of Taiwan Ma Ying-jeou. A return student from Australia, Kung Tsui-cheng works for a private company. Thanks to his lineage, he is likely to follow in the footsteps of his deceased grandfather and be appointed Senior Advisor to the President, a Ministry of the Interior source said yesterday. There are some big changes awaiting him in the ceremonial job. 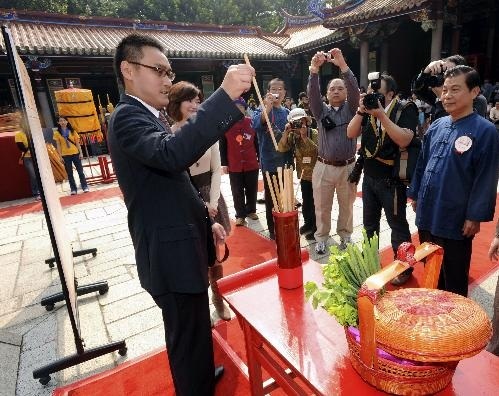 For one thing, the new sacrificial official will receive no remuneration for the once-a-year appearance at the Confucian Temple in Taipei. Confucianism was for a long time China’s state religion, but this designation was rescinded folowing the birth of the Republic of China in 1912. However, Kung Teh-cheng was made the Holy Duke of Yan at birth in 1920 and held that title until 1935, when he was proclaimed the county’s first Sacrificial Official to the founder of Confucianism. This year in Taipei, Kung Tsui-Chang returns to Taiwan from college in Australia with an ancient purpose. 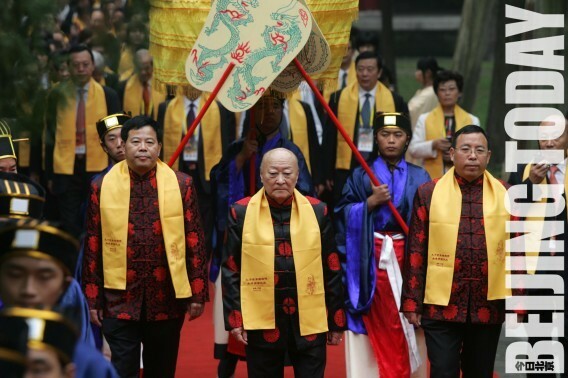 The 79th lineal descendant of Confucius, Kung will oversee ceremonies as the Sacrificial Official at the Confucian Temple. This temporary title is ancient, held exclusively by male descendants. Although Kung is 24 and has only recently procured a job in Taiwan, he will likely follow in his departed grandfather’s footsteps as Senior Advisor to the Provincial Governor of Taiwan Ma Ying-Jeou. In his twenties Confucius began formulating his own personal philosophies, quietly expressing them to those he engaged in conversation. A group of devoted followers, or disciples, began to form around him. Enjoying his wisdom, they encouraged Confucius to go into politics, in order to more greatly help others in need in the community. Confucius was said to be a man of few words, living his life in a relatively unassuming manner, until an injustice pulled him to speak up politically on behalf of those he served. When he felt a need to express his thoughts at the temple or Court, he spoke strongly, albeit choosing his words with great care. At the age of fifty, Confucius’ wisdom and political talents were recognized, and he was appointed Minister of Public Works for the Province of Lu. He did well at this position, and was promoted to the position of Minister of Crime. His pursuit of justice in this position offending many in power, and Confucius found himself forced into exile, his faithful disciples by his side on his travels, many of which became the stuff of legend and myth. In 484 BCE Confucius was able to return to Lu, founding the Ru School of Chinese thought. Although surrounded by a populace still held apart by an iron-clad ranking system, Confucius never refused a student based on societal status. All that a student needed to take part in learning was a deep desire to do just that. Considering himself to be a transmitter of ideals long-established before him, Master Confucius added to the traditional belief that our lives were predetermined, the additional warning that we are all responsible for our actions and treatment of others. The statement that he was merely passing on ancient and obvious values made his philosophy easy to accept; however, much of what Confucius taught was radical, an extreme departure from previous streams of thought. Confucius’ philosophy centered around the concept of Ren, or “compassion,” a philosophy lived best through self-deprecation, casting off self-aggrandizement for the mantle of simplicity in thought, action and speech. The society that embraced Confucius’ line of thinking was one wherein the most humble of men and women, the ones whose lives were lived in support of those around them and the greater society, were to be the most respected. Confucius taught that those in power must not oppress those they served, nor take them for granted. Confucius began writing his most famous works: the Book of Songs, Book of Documents, and many others. It was during this latter period of his life that Confucius began to associate himself with an even deeper sense of spiritualism. He collaborated with many authors on a variety of spiritual topics, earning his position as spiritual leader and predecessor to countless Chinese philosophers, religious leaders, historians, scholars and teachers. Despite the largely-held belief of the time that knowledge was imparted to the people by wise ancient Spirits, Confucius held fast to the philosophy that true wisdom was achieved through voluminous study, discussion and experience. It is this ethic that has forevermore fastened the label of Sage under his visage and memory. Although largely ignored by the masses during his 72-year life, only after death was the value of Confucius’ wisdom truly noted. By the end of the 4th Century BCE, it was agreed that had Confucius’ wisdom been duly recognized during his lifetime, he would’ve been a king. Confucius’ influence on Eastern culture has been compared by scholars as comparable to that of Socrates on Western civilization. Confucianism was China’s state religion until 1912, with the birth of the People’s Republic of China. There are a variety of methods to gain a following in one’s life, whether at work, at school, at play or here in social media. The one that contains the greatest reward is in supporting those you meet on your journey, helping them to grow and connect with others. Take guidance from Confucius himself, and be modest and supporting in your statements and actions, treating all equally. Make your friends successful; help them get a foothold in life, and they will follow you through any storm or fire…. With a history of over 2,500 years covering more than 80 generations, and the longest family tree in the world according to the Guinness Book of Records, the fifth edition of the Confucius Genealogy will be printed in several volumes in 2009, according to an organizer of the Confucius Genealogy Compilation Committee (CGCC). It has taken ten years to compile this latest list of descendants of revered Chinese thinker and educator Confucius (551-479 BC) but along the way there have been wrangles as to whether it is of national significance or purely a family affair, and whether the genealogy should be seen as a Chinese cultural heritage or a hangover of Feudalism. Kong Deyong, a 77th-generation descendant of Confucius and head of the World Federation of Confucius Descendants. 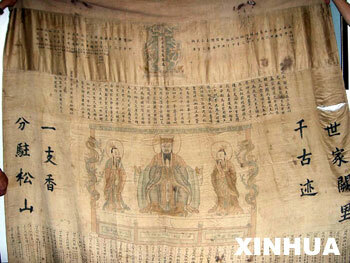 The Confucius Genealogy, originally recorded by hand, was first printed in 1080 AD during the Northern Song Dynasty. Since then it has been revised only four times, during the reigns of Ming Emperor Tianqi, Qing Emperors Kangxi and Qianlong, and finally in 1937 during the Republican period. In the turbulent decades since 1937, many descendants of Confucius left the sage’s hometown of Qufu in Shandong Province, some changed their family name, some changed their religion and others moved overseas. All these circumstances made it difficult to trace the sage’s modern descendants and it seemed the links in the bloodline would be irredeemably broken. Then in 1998 Kong Deyong, a 77th-generation descendant and head of the World Federation of Confucius Descendants, set up a committee in Hong Kong to update the family tree. More than 450 branches were set up around the world to assist in the work. 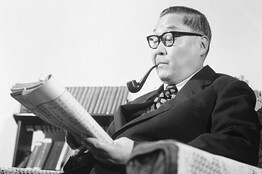 According to the genealogy’s chief editor Kong Dewei, the fifth edition contains over 1.3 million new entries. Living descendants have to pay five yuan (70 US cents) to be included. The dead get in for free. The 1937 edition had 600,000 entries, so the new edition contains more than two million. Cultural heritage or Feudal hangover? The revision work ran into some initial difficulties, ranging from social resistance to the whole idea, to distrust on the part of some of the descendants. Kong Deyong said that after the People’s Republic of China was established in 1949 campaigns against the “Four Olds” (old customs, culture, habits and ideas) meant that people stopped talking about their family trees and considered them relics of feudalism. Since the opening-up policy began in the 1980s, the situation has changed, but many people are still reluctant to talk about the subject. Some positively believed that revising the family tree was just dredging up the feudal past. In 2000, CGCC Office Manager Kong Dehong went to visit a group of descendants in Taixing, in Jiangsu Province. But when he got there they chased him away. “They wouldn’t let us in and refused to register in the genealogy. As we were leaving, they shouted ‘We won’t register, but we will never forget our ancestor! '” Kong said. Another problem was that to collect funds for the project people were charged five yuan to have their names included. Many, however, suspected that it was all a con-trick. Kong Deyong says they were not aiming to restore the feudal system but simply to preserve an important aspect of China’s cultural heritage. The Confucius Genealogy is in once sense just a family affair, but it has a long-standing and significant position in China’s history. It would be a great loss if it were not recorded. Family histories are important and useful historical records, comparable with national and local archives. Xu Shixuan, a researcher at the Chinese Academy of Social Sciences, agreed that long-term family trees are of significant reference value for social research in demography, the study of names, folklore, ethnology, the clan system, changes in family structure over time, and migration, and added that the revised edition of the Confucius Genealogy would be a valuable resource. For the first time, women, members of national minorities and overseas descendants have been included in the genealogy said Kong Dewei. Having women in Confucius’ genealogy is a first for the Confucius clan, but also a rarity in the history of genealogy in China where a centuries-old mentality – derived in part it has to be said from Confucianism itself – has traditionally valued men and disparaged women. In 2003, Kong Kaiping became the first woman to have her name included in the Confucius Genealogy. After becoming a CGCC organizer, she spent three years looking for clansmen in Jiangsu Province, adding around 80,000 names to the genealogy. 71-year-old Kong Xiangxian who lives in Xuanwei City in Yunnan Province, is another unlikely entry in the genealogy. As a Muslim he would have been excluded from previous editions. From 2000 to 2002, he visited many elderly people, researched old village inscriptions and uncovered the interesting history of the area’s Islamic descendants of Confucius. In 1715 in order to cement an alliance with the Hui ethnic group, many Confucius descendants married Hui people and converted to Islam. The materials Kong Xiangxian collected are now stored in the Xuanwei city archives. According to CGCC, other descendants of Confucius married into the Miao, Shui, Hani, Jingpo, Tu, Dongxiang, Tibetan, Manchu, Bao’an and Tujia ethnic groups. Still others moved to Korea, the USA, Singapore and other foreign countries and regions. 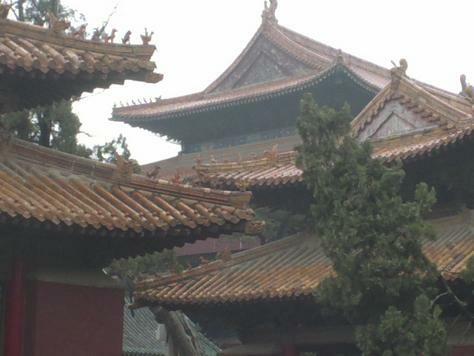 Kong Xiangxian said the inclusion of non-Han descendants showed that after 2,500 years of social progress, the Confucius family had become tolerant and inclusive. This genealogy, of a branch of the Confucius family that was “lost” for a thousand years, was found by genealogy researchers in Xiyang, Shanxi Province. This hand-written genealogy, of a branch of the Confucius family that was “lost” for a thousand years, was found by genealogy researchers in Xiyang, Shanxi Province. Their ancestor was 37th-generation Kong Qican who lived during the reigns of Emperors Daizong (762-779) and Dezong (780-805) of the Tang Dynasty. The family moved to Yongning in Henan (present Luoning County of Henan) and lost contact with the rest of the clan for 1,200 years. Kong Dewei said that around 900 Taiwanese descendants of Confucius have been recorded in the genealogy, mainly from Ping Tung and Tao Yuan area of Taiwan. Kong said today the ideas of Confucius were regaining popularity all over the world and his descendants are taking pride in rediscovering their heritage. He said more and more people were beginning to understand why updating the genealogy is important. That since Kong Yanling once took refuge with his friend Qu Yaotian after a trade dispute, (Qu had no son and in gratitude for his help was allowed to adopt one of the Duke’s sons. The boy’s surname was changed to Qu and the Qu’s of Heze are his descendants.) ICCR recommendation is that the Qu’s will be required to change their surname to Kong-Qu (Qu being included and retained in honour of the action by Confucius). This form of ‘name’ adding could be used to increase the pool of surnames as well as indicate titled male persons who married into noble clans that did not have male descendants. The Kong Clan Mausoleum Forest Necropolis featuring 2500+ years worth of various eras of gravemarking styles, is the final resting place of Confucius and his descendants. Prominent members of the Kong family are buried here. The total area of the cemetary is around more than 2 square kilometers, making it the largest, and oldest, cultivated forest among other Forest Mausoleum Necropoli of various great families in China. Much like temple guardians, several rare species of spiders once thought extinct like the Haplogynes can be found in comfortably inhabiting the dryer areas in the larger mausoleum complexes here including the Orb Weaver and other large bird catching species. The Arachnotechnology Institute of China is currently studying the breeding and training of spiders, development of spidersilk based super materials for a new generation of lightweight materials for construction and military uses (a natural extension from silk worms including various DNA based projects and also pet trade for spiders which can live quite comfortably in isolation from communities. Records and study of text fragments in what is tentatively called an ‘Arachnidia Chinensis’ have been recently unearthed among old family records stating that Confucius in his free time, had among his vast studies of nature at one point, also privately bred among other cultivated rare plants and animals, a colony of spiders. 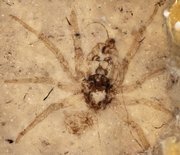 The manuscript fragments are being restored for display at both The Arachnotechnology Institute of China and the propose Arachnid Complex which will agglomerate strategic points of the Forest Mausoleum complex. All above featured pictures copyright of respective owners.